Legendary and Universal Pictures have released a new extended As Above So Below red-band trailer for director John Dowdle’s (Quarantine) upcoming horror film. 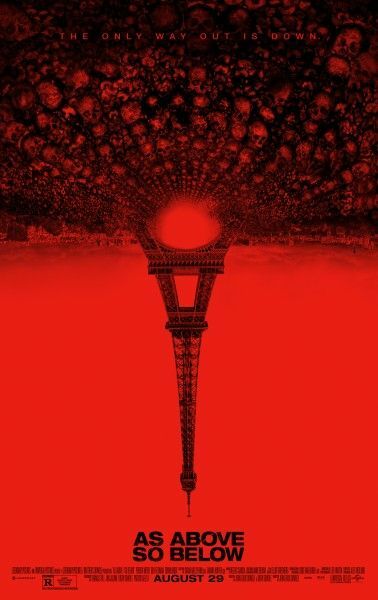 The pic takes place in the Paris catacombs, as the 200 miles of twisting tunnels six stories below the surface offers a unique and terror-filled setting. Born out of the Dowdle brothers’ desire to make a found footage Indiana Jones-type film, the story follows a group of people who find that as they go deeper into the catacombs, they’re each forced to face their own personal demons. This actually looks like a pretty promising entry in the horror genre, as the terrifying nature of the real-life catacombs offers a sort of “descent into madness” atmosphere to the proceedings. Hit the jump to watch the new As Above So Below red-band trailer, and click here to read our interview with the Dowdle brothers at Comic-Con. The film stars Perdita Weeks, Ben Feldman, and Edwin Hodge. As Above So Below opens in theaters this Friday, August 29th.